Kettering Town closed the gap on Evo-Stik League South Premier Divison Central leaders Stourbridge to just to a single point as they beat Royston Town 1-0 at Latimer Park. Having suffered a midweek setback in the 3-2 defeat to Biggleswade Town, the Poppies made a swift return to winning ways and were given a helping hand by Hitchin Town who ended Stourbridge’s long unbeaten run with a 2-1 victory. It means the Poppies are now a point behind with two games in hand and they will hit top spot if they beat Coalville Town at Latimer Park on Tuesday night before the top two collide in the West Midlands next weekend. Marcus Law’s team were well worth the three points as they dominated for long periods. 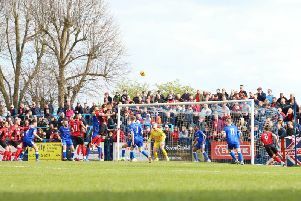 Aaron O’Connor missed the best chance of the first half when he scooped his shot over the bar after Ben Milnes’ shot had been parried by Royston goalkeeper Joe Welch. But O’Connor made amends by grabbing the only goal of the game with 20 minutes to go when he beat Welch with a fine low finish after being played in by Lindon Meikle. Royston had Sam Corcoran sent-off for two bookable offences and Kettering saw things out with relative ease in the latter stages. AFC Rushden & Diamonds maintained their push for a play-off place in the Premier Division Central with a 3-1 victory at bottom side Bedworth United. Diamonds, who had Jack Ashton back on the bench after injury, opened the scoring five minutes before half-time when a Zack Reynolds shot fell into the path of Declan Rogers and he fired inside the far post. But Bedworth levelled on the stroke of half-time when Montel Gibson tapped home after Ben Heath was unable to hold on to a cross from the right. However, the game swung in Diamonds’ favour when Bradley Maslen-Jones was sent-off for bringing Ben Diamond down when he was through on goal. From the resulting free-kick, Diamonds won a corner which was headed home by top scorer Tom Lorraine. And Lorraine struck again to seal the points just past the hour when he swivelled in the area and fired home after good work from Diamond. Elliot Sandy hit a hat-trick as Corby Town kept up their bid for the Division One Central title with a 4-1 success at Aylesbury. The Steelmen made the breakthrough on the stroke of half-time when Sandy took the ball in his stride and rolled it under the home goalkeeper. The lead was doubled on 68 minutes when Connor Kennedy headed home a Jordon Crawford corner. And Crawford was the provider again four minutes later when he found Sandy who made it 3-0. Aylesbury pulled one back through Ty Deacon’s shot from the edge of the area. But Corby wrapped things up in stoppage-time when more good work from Crawford set Sandy up to complete his hat-trick. The Steelmen will be hoping to pick up another win on the road when they head to Welwyn Garden City for a re-arranged clash on Tuesday night.